Rock luminaries SIXX:A.M. announce the release of their fifth studio album Vol. 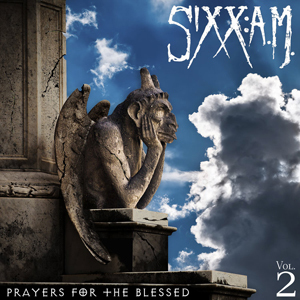 2, Prayers For The Blessed, out November 18 via Eleven Seven Music. The album will be available for pre-order beginning October 14. Written and recorded at the same time as Vol. 1 Prayers For The Damned, released earlier this year, the album acts as a companion piece to the first chapter while simultaneously elevating the band's sound in every area. Fans can sample songs from the album NOW via the album teaser below. SIXX:A.M. will continue to tour across Canada through September 18 with one dollar from each ticket sold on the tour going to the Canadian Red Cross to support their relief efforts. The trio will head back out on the road in October for their US arena tour with FIVE FINGER DEATH PUNCH, SHINEDOWN, and AS LIONS. The tour commences October 18 at Verizon Arena in Little Rock, AR and includes stops Denver, Las Vegas, Anaheim and Philadelphia—full tour routing below. Tickets for the tours can be purchased HERE. Formed in Los Angeles in 2007, SIXX:A.M.’s mission has remained steadfast: to provide the masses with iconic, hard rock that boasts unrivaled musicianship. Comprised of vocalist and producer James Michael, guitarist DJ Ashba, and bassist Nikki Sixx, the band has sold over 1 million albums globally of their four previously released studio albums; The Heroin Diaries Soundtrack (2007), This Is Gonna Hurt (2011), Modern Vintage (2014), and Vol. 1 Prayers For The Damned (2016). Prayers For The Blessed is the second installment of their 2016 double album. "Barbarians (Prayers For The Blessed)"
"We Will Not Go Quietly"
"That’s Gonna Leave a Scar"